Posted on Wed, Feb 8, 2012 : 1:22 p.m.
Not many things can lay claim to preceding or overshadowing coach Red Berenson when it comes to the Michigan hockey program. The Wolverines’ in-state rivalry with Michigan State is one of those things. The fourth-ranked Wolverines will renew their rivalry with the No. 17 Spartans Friday (7:35 p.m, Big Ten Network) at Munn Ice Arena in East Lansing and Saturday (7:35 p.m., Fox Sports Detroit) at Joe Louis Arena in Detroit. For players who grew up in Michigan, the rivalry is an opportunity to play against former teammates. 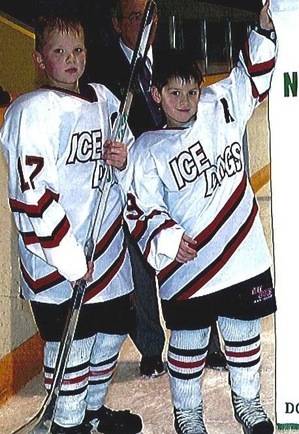 David Wohlberg, left, and Torey Krug pictured in 2001 when they were teammates on the Michigan Ice Dogs. Wolfe, Krug and Wohlberg were on a team coached by Krug’s father, Kyle Krug, that won the 2003 PeeWee national championships and the Quebec International PeeWee tournament. Having grown up teammates only raises the stakes when the players meet now. Krug and Wohlberg played so hard when the teams met during the 2009-10 season, they were both hit with coincidental minor penalties. Wohlberg would eventually be given a game misconduct for the altercation. Michigan senior forward David Wohlberg and defenseman Greg Pateryn grew up playing with Michigan State captain Torey Krug and forward Greg Wolfe for the Honeybaked Hockey Club.Krug laughs at the memory. Kyle Krug recalls the altercation as a proud moment. During the offseason, players from Krug’s former team still get together to skate and having bragging rights from the latest renewal of the rivalry is a sacred claim. Michigan's David Wohlberg, left, and Michigan State's Torey Krug grew up playing together on the same team. Wohlberg can currently claim to be the Wolverine with the most point in the series with nine goals and eight assists in 18 career games against the Spartans. Wolfe, Krug, Pateryn and Wohlberg's history is one of many connections of former teammates in the rivalry. Luke Moffatt and several other Michigan players played with Spartans goaltender Will Yanakeff for the United States National Developmental team and Wolfe and Michigan defenseman Mike Chiasson played juniors together for the Omaha Lancers of the USHL during the 2009-10 season, to name a few. Michigan will be without co-leading scorer Chris Brown in the opening game of the Michigan State series as he serves a suspension for his fight with Miami captain Will Weber in the third period of last Saturday’s 3-0 win. Whether defenseman Greg Pateryn will join him remains to be seen. Pateryn was issued a five-minute major and game misconduct for contact to the head late in the third period on Saturday. CCHA director of officiating Steve Piotrowski reviews all misconduct penalties to determine whether further suspension is warranted. Piotrowski was at Yost Ice Arena for Saturday's game, but the same process will still be followed in terms of review. It may hurt Pateryn that his hit came just 21 seconds after Miami’s Steven Spinell was called for the exact same infraction, as it may be seen as retaliatory. Thu, Feb 9, 2012 : 1:15 p.m.
Sure wish Chris Brown showed a little more maturity in not getting into fights. Leaders and Captains should be examples and learn to not lose their cool. We needed him at Munn and now he's no help.